2015 is now officially in full-swing and with the excitement of the New Year comes the excitement of getting to play some of the most realistic and technically flawless video games available on the Sony PlayStation4 console. But then again, you would not expect anything less from a machine that Sony says is ‘ten times as powerful as its predecessor, the PS3’. 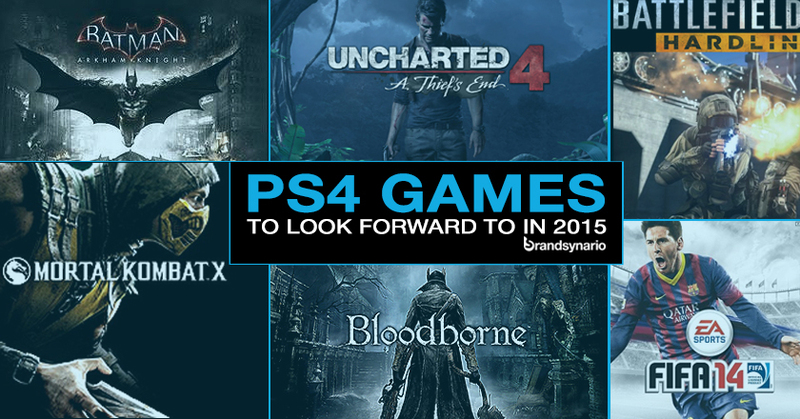 Here Brandsynario takes a look at the top games to look forward to in the year 2015. After the release of the much-acclaimed 2011’s Batman: Arkham City, the original Arkham Asylum team at Rocksteady Studios took a backseat and started working on this new game. Arkham Knight’s story is set after the events of Arkham City, with Batman battling the Scarecrow, who, upon his return to Gotham, has schemed to kill the Dark Knight by uniting Batman’s enemies. With advanced gameplay mechanics, including new armory and brilliant Batmobile operation, this one is definitely one of the games of 2015! Developed by Naughty Dog, Uncharted 4: A Thief’s End is an action-adventure third-person shooter game, developed exclusively for the PS4. Nathan Drake, several years after his last adventure in Uncharted 3: Drake’s Deception, is forced to jump back into the world of thieves in pursuit of a conspiracy revolving around a legendary pirate treasure. Published by Electronic Arts and another first-person shooter, Battlefield: Hardline is the story of Officer Nick Mendoza and his partner, veteran detective Khai Minh Dao, who follow the drug supply chain from the streets to the source in a drug-stricken city of Miami and soon find out that power and corruption are much superior to the law in a city in Mafia-rule. This action RPG takes place in the gothic, ruined city of Yharnam which houses a potent medical remedy that many travelers come to the city for, to cure their illnesses. The player takes the role as one of these travelers. Upon arrival, it is revealed that the city is plagued with a rife disease that has deformed most of its residents into unhuman creatures. • Mortal Kombat X Release Date: April 14, 2015 The legendary fighting video game brings its brutality on the PS4 with all the fighters possessing an arsenal of new attack variations. This single-player, action-adventure game is set in a different history London, where an old order of knights keep the world safe from monsters who are half animal and half man. This list would, of course, be incomplete without the addition of..